The Beech entered an uncontrolled descent from 10500 feet and crashed. Last radar returns indicated a continuing left turn and descent through 5600 feet msl at 18000 feet/min. 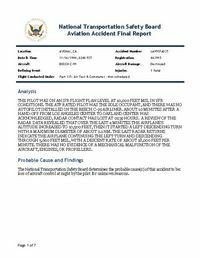 PROBABLE CAUSE: "Loss of aircraft control at night by the pilot for unknown reasons." Distance from Burbank/Glendale/Pasadena Airport, CA to Oakland International Airport, CA as the crow flies is 520 km (325 miles).